Has your Kia been dinged or dented? Problems like these can happen to anyone, no matter how careful of a driver you are. Fortunately, you don’t have to take your vehicle to the body shop to get them fixed. EZ Dent is a specialist in Paintless Dent Removal (PDR). This process can fix many dents more effectively and more efficiently than a trip to a traditional body shop. Paintless Dent Removal uses special tools that carefully massage a dent back into position. Unlike bonding agent repair techniques, which can damage your Kia’s paint, this process preserves your car’s paint and ensures the fix looks as close to new as possible. 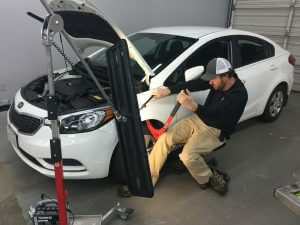 PDR is often used by dealerships to repair cars that are still on their lot. They know the process works – and if it’s good for the cars they’re trying to sell you, it’s good for the car you have. How Fast Can You Fix My Kia? Unless your vehicle has suffered particularly severe dents, the repair job will likely take one hour or less. Exact timetables will vary based on a variety of factors – how big the dents are, where they’re located, what sort of Kia you have, and so forth – but most jobs are done in this frame of time. Why Don’t You Need A Body Shop? The tools used for Paintless Dent Removal are portable. This means that we don’t have the expense of operating a full-service shop, and we can pass the savings on to you in the form of more competitive pricing. It also means we can come to you and make the repairs at a time and place of your choice. *Disclaimer – EZ Dent is not affiliated with Kia or authorized Kia dealerships. To schedule an appointment for fixing your Kia’s dents, contact EZ Dent today.